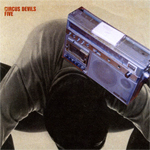 Early release info: Pollard is currently collaborating with GBV producer Todd Tobias on the fourth Circus Devils album entitled "Five" to be released May 9 [later changed to 5/16]. Apparently, the 4th Circus Devils album Sgt. Disco has been shelved. Note: detailed album and track credits provided by Todd Tobias.